1.) Today is the last day of March, which is still leaving me dumbfounded. April 1st is tomorrow folks...Where did the time go? Ready or not (I know I am) the summer fishing season is just around the corner. All of the flies anglers have tied over the long, cold winter will soon be put to the test from June until September. With the ongoing storms ringing in healthy amounts of rain, along with several snowstorms, this summer may shape up to be a lot better than last year's conditions. "Abnormally dry" is the status from roughly I77 east, and then from approximately the Pee Dee River east the drought has been contained. (areas adjacent to the coast are in an abnormally dry state...). Also, the hot temperatures NC has experienced in the summer has really affected the fisheries in the state. Basically, when the water temp rises to 70 or above, trout start dying. Without the rhododendron overhanging the streams, a lot of the trout simply would never make it through a summer. Rhododendron aren't just fly nappers, they keep those trout alive in the heat of the summers by providing shade. 2.) Fishing report~ Water levels are looking great if you plan on heading out to your favorite trout stream over the next few days. On warm days, the trout will be looking up. Dry flies to use include Elk Hair Caddis, Stimulators, Quill Gordons (wet and dry), Blue Quills, Adams, Para Adams and most attractor dries (Trudes, Wulffs, etc). Nymphs~ Copper Johns, Lightning Bugs, Pheasant Tail Nymphs, Red Fox Squirrel Nymphs, and even Y2K's and Pat's Rubber Legs. If you are still not catching any fish on these patterns, pull out a Fat Albert or something along the lines of a Fat Albert. Most fish have not seen these types of patterns since last Summer/early fall, so they may be willing to investigate the fly. 3.) Thankyou for stopping by and reading. Everyone have a good week and tight lines. 1.) Finally Friday has come...Slowly, but it's here. What a Friday it's been...rainy, warm and overcast. BWO's anyone? Severe storms are looking plausible tomorrow afternoon across the Carolinas. I cannot stress enough how important it is to have a NOAA weather radio especially at night. Tomorrow may have the potential for a few "porch-pounders". Tornadoes are also possible....isolated, but possible. Sunday will mark the beginning of the clearing out process, and the sun will finally come out. We have seen a heck of a lot of rain this year. Still not quite enough to stop the drought, but we'll take what we can get. I hope this fishing season isn't as bad as last year. Last summer brought hot temperatures (upper 90's in late May and early June), and not to mention the PROLONGED drought across the state...Especially the mountains. 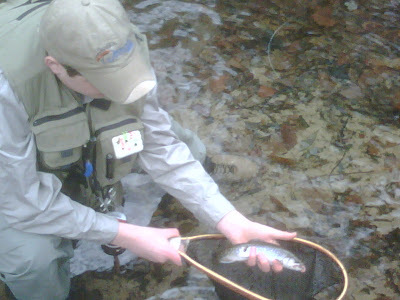 Spring and Fall are the prime fly fishing seasons for NC anglers. 2.) Fishing will be great once the rain and storms are gone by Sunday. Water levels are high, but after a few days fishing will be exceptional. Most fish can be caught on large streamers as of now, due to the high water. Zonkers, Buggers, Galloup's Zoo Cougar's, Sculpzillas, Slumpbusters, etc should catch plenty. BWO's may also work, as the rain, warm air, and overcast skies tend to bring them out. Black Caddis are still out as well as Quill Gordons, Blue Quills, and a few brown stoneflies. If you can, try to stay on the bank and out of the water. This will minimalize the fish spooking from seeing you. All in all, most of the streams are looking good in terms of water levels. 3.) Thankyou for stopping by and reading. Everyone have a good weekend and tight lines. 1.) It has been a great day weather wise across the entire state. Most folks Piedmont wide, saw temps hit the 70 degree mark today. Tomorrow will be a few degrees cooler, with mid to upper 60's, but come Wednesday, the temperatures will take a nose dive and upper 40's and low 50's are making the day on Wednesday look dreary, as well as rainy. As we progress into Thursday, a cold front that is producing severe storms and sporadic tornadoes over the upper mid west will roll through the area, with it bringing storms, some of which could be on the strong side...We are getting to that time of year where a NOAA weather radio is almost an absolute necessity. Especially when we have the threat of super cell thunderstorms during the night time hours that spawn uncommon, but very real threats....tornadoes. Although rare, tornadoes do occasionally occur in the Tar Heel State. 2.) 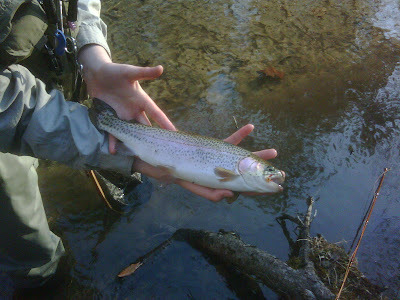 Now, after drifting to non-angling talk, here's the report...Fishing has been fine across most areas in the mountains. The only thing to think twice about fishing is the usual South Mountains State Park, but only due to the decrease of fish (Probably not many left). Poachers have been horrible over the years in South Mnts. Usually in an average year, the fish are all gone by the first day of Spring. It's that bad over there. Also flooding of the Jacob Fork River a few years back has flushed out the thriving populations of trout, aiding in more frustration of anglers. If you really want to see and have a chance at consistently catching fish, try fishing Stone Mountain. The East Prong of the Roaring Fork is stocked, in good shape, and should be great until probably late June to early July. I did see a few small Gray Drakes on Saturday, along with a lot of tiny cream midges that were about a size 46....Bugs are hatching. This includes sporadic Quill Gordon, Blue Quills, and a few Gray Drakes, small black caddis, small brown stoneflies, and cream midges. Tippet sizes should be around 5x-6x. I used 5x all day Saturday, and I think I could have got away with 4x in a few spots, but really your catch rate will improve with 6x on. Since the water is clear, wear drab colored clothing (gray, black, brown, camouflage even). Stay low, and staying on the back and minimalizing wading can also help catch rates. 3.) Thankyou for stopping by and taking the time to read. Everyone have a good week and tight lines. Well, we took off for Stone Mountain to fish the East Prong of the Roaring River and it was GREAT to say the least. I started ot at the old church in the park and within the next hour and a half I had about 8 fish on the board. All of them where rainbows and brookies. Following the church stretch of the river, we tried a spot I have always caught good numbers of fish, and after tying on 5x tippet and a San Juan Worm, I managed to entice this hefty 'bow into grabbing my offering. He put on quite a show, as he jumped out of the water and then hugged the bottom for the remainder of the fight. All in all one of the best trips I've had in a while. Plenty of fish, nice weather, and the crowds where not that bad. 1.) It has been a great day across the Carolinas with the weekend shaping up to be nice, but a little on the cool side...Upper 50's and lower 60s across the state. A little last minute planning and as of now, I may be heading up into the mountains to fish Stone Mountain State Park. The Davidson River was a little to long for a trip tomorrow, so I'm settling for Stone Mountain, as I've heard that the recent stockings have helped to really re-populate the East Fork of the Roaring River. All three species have been stocked into all of the rivers/streams in the park, so it's been fairly decent up that way. 2.) PT nymphs, Lightning Bugs, BWO nymphs, stonefly nymphs, San Juan Worms, as well as any attractor dry/wet/nymph pattern have been working. 3.) If I do go tomorrow, I will post a report. 4.) Thankyou for taking the time to stop by and read...tight lines to all. 1.) Where did all the rain go? The ongoing classic NC wedge has now eroded as well as the moisture transport that allowed for continuous rain showers since late last week. It's now in the lower 60's across most Piedmont locations. According to the ten-day, we will gradually warm up and then gradually cool down and then once again warm up and so on...The ups and downs in weather never fail...especially from late Fall through mid Spring. We have had record breaking temps in the teens as early as the middle of November while surprise early Spring snowstorms have occurred in late March. Welcome to the Tar Heel State. Home of wild weather. 2.) There are still reports of Quill Gordons, Blue Quills and Black Caddis out on the streams. They still aren't hatching in impressive numbers, but I would say over the next few days rivers will see more bug activity. If you're fishing in the next few weeks, consider using Black Caddis patterns, as anglers have reported seeing B. Caddis activity. I came up with a pattern that is absolutely DEADLY on the Davidson River...I dubbed the name "Tyler's Realistic Black Caddis", which is relatively easy to tie, but still can be tough during certain steps. About a year ago, I was on the Davidson, trying to match the hatch and find the best bug for the job. Since it was late March, I figured that Black Caddis were most likely imminent, so I tied on one of my TRBC's after minutes of digging around in my boxes. 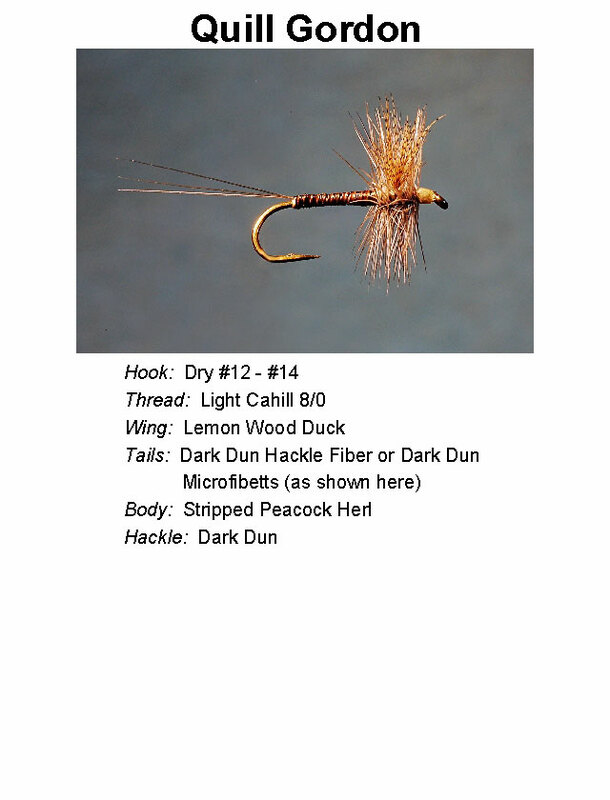 I performed a roll cast to a nice looking brown trout on the opposite side of the river that has refused virtually all of my other offerings, but, right when I saw the fly hit the water, he attacked my creation of foam, marabou, and moose mane with reckless abandon. Ever since I have always carried at least a few of these patterns with me. 1.) The hatches are occurring as I type, not exactly in huge numbers, but more sporadic in nature. Most of the bugs that are hatching are Blue Quills with a few Quill Gordons mixed in. A few anglers have even reported seeing a few small black caddis and a couple of brown stoneflies. Again, we are still anticipating the "monster hatch", which so far has eluded us for the most part. The south is about to get a wake-up call starting tomorrow, and then dropping like a rock on Friday with highs struggling to make it out of the 30's for highs across the Piedmont with significantly cooler temps in the mountains. It was in the lower 80's today...By Friday, we will cut the 80 in half, in return for 40 degree readings. With the cold air, rain may be an ongoing sight through Wednesday of next week. A 60% chance Friday, a 40% chance Saturday-Tuesday, and a 30% chance next Wednesday prior to warming back up into the upper 50's and low 60's by Wednesday and beyond. Keep in mind that albeit the air temps will start to become chilly again, the water temps will still somewhat retain the warmth for a day or two after it starts getting cold...In other words, good fishing can still be had as we progress through this late winter "cold spell". 2.) From what I I've seen as well as past experiences, Green Weenies are working well right now, as well as Quill Gordon nymphs/wets (maybe a dry). Isonychia Bicolors (Anglers use the Adams fly to imitate these) are sporadically hatching in a few spots across the mountains. Sticking with a nymph, be it a stonefly nymph, Lightning Bug, or PT nymph, you will likely have more success rather than presenting dries. Unless we see a good number of bugs hatching at one time and the trout enter a frenzy and become selective, nymphs are probably better to use. 1.) I talked to a few fellow anglers over on the Southeast Fly Fishing Forum who said they were positive they saw Quill Gordons hatching on the Chattooga River today. So now we have reports that indicate, yes, there are Quill Gordons hatching out right now. I've heard that the Blue Quills are starting to hatch as well as a few March Browns. For Quill Gordons, #12-14 have proved to be the most reliable sizes to use. The trout are looking up for any bugs on the top folks so have at it and enjoy, it's gonna be a GREAT weekend for fishing. I may walk down to our local stream and get my waders wet (do a dare say wet wade?) Have a good one folks. Tight lines and catch a bunch. 1.) I apologize for the lack of posts over the last few days, it has been one of those weeks. Anyway, the state will experience very comfortable and mild temperatures for several days. Perfect weather for fishing and camping. Right now at 6:00 PM it's 68 degrees. At one point in the day, around 4:30 we reached 72 degrees. HUGE difference in temps from what we saw earlier this week. Most places have gone from 20 degrees below average to 20-25 degrees above average. I'm pretty confident in saying that the Quill Gordons and Blue Quills will make their first appearance of the day soon...(as soon as this weekend). Make sure you have a handful of QG patterns...Size 12 is what will be working. 2.) Like mentioned above the QG's and BQ's will most likely start to emerge this weekend, as very warm temperatures start to overcome the southeast. The lower rivers and streams will see the hatch first, and over time the hatch will eventually make it up the mountain to the higher elevation streams. 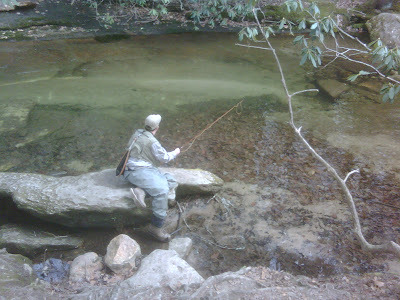 Once the water temperature hits the 50 degree mark, the trout will start to look for insects on the top of the water. If you have a digital thermometer, it will come in handy over the next few days. If you do take a trip out to the river, 5x is pretty much a generic size of tippet. If anyone sees a few Quill Gordons or Blue Quills, report back. 3.) I Just received my Simms Waderwick I ordered a while back. So far it's as good as Under Armour, and it's designed with fly fishing in mind. Simms had to ship it from Bozeman, MT, and then to the fly shop, and then to my grandad's house in TN, before finally arriving here at my house...Kinda bears a resemblance to the snowstorm on Sunday...Originated out of MT rolled into Tennessee, and then plowed through NC. 4.) Everyone have a great weekend and try to get out on the river...it's gonna be nice out there. 1.) The Blizzard of March 1st has moved through the area and now has traversed out of the state. It's hard to believe that this storm originated in eastern Montana and progressed through the plains states, then through western Tennessee (where Memphis received a foot). Across the NC Piedmont, snow totals ranged from an inch to 10". Gaston county folks where underneath an intense and heavy snow band for at least 2-3 hours, which in return amounted to 9-10". Here in Cabarrus county we received 4" with a few communities receiving 5-6". Jim Cantore, affiliated with the Weather Channel was reporting live here in Charlotte, so it had to be a big storm. All in all it was a very beneficial snowfall, as the short term drought is better, and the long term drought is getting there. It will be another cold one tomorrow, although not as cold as today. We still have to get through tonight's FRIGID and I mean FRIGID temps. Tonight's lows will in general drop to the lower teens, and will range from about 10-15 degrees. Don't be too surprised if a few rural areas get down to the upper single digits (9 or so) by tomorrow. After the cold, the warmth will soon follow, and upper 60's to low 70's will be ushered in by late week. Fishing will improve soon! 2.) As the temps start to rise towards the middle of the week and especially late in the week, the fishing will improve. Still no sign of quill gordons, but seeing that the temps will be warm, this weekend may yield a few QG's. Really, the criteria for the start of the quill gordon hatch is at least 5 days of warm weather (water temps too) for the bugs to start coming off the water. Just carry a few QG patterns with you if you head out to the stream late this week.